Have an old set of clubs packed in the corner of your garage? 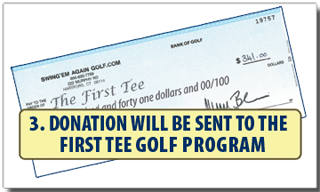 Donating golf equipment to Swing'em Again Golf becomes cash to your local First Tee Chapter. A check for the value of your used clubs and equipment is sent to The First Tee by Swing'em Again Golf as a donation on your behalf. 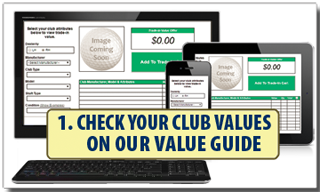 If you have equipment to donate that you cannot find on our value guide, download an Inventory Log Sheet and add it to your shipping box along with the Club(s) you are donating so that we can send the adjusted amount to The First Tee. You can also donate golf accessories such as golf balls, apparel, golf bags, range finders, etc. Please contact our purchasing department before sending them to determine the donation value of your accessory items in advance. 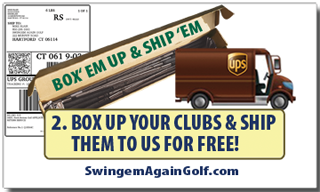 When shipping your equipment to Swing'em Again Golf, please print your FREE shipping labels and include a copy of your donation summary in each box. The donation summary can be printed directly from the website or from your email confirmation to be used as your receipt to track donations to The First Tee.